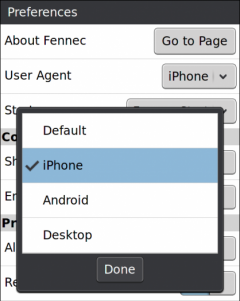 Phony - Firefox Addon - Access different versions of mobile websites by changing the user agent string to match iPhone, Android, or desktop browsers. Warning: Some iPhone- or WebKit-optimized sites may not work correctly in mobile Firefox. · Now compatible with the native Android UI in Firefox Aurora and Nightly builds. · Update for compatibility with Firefox 8. · Version 0.3 adds Microsoft Internet Explorer to the list of options.